Did a little baby sitting yesterday. Maybe the right word is puppy sitting. Our neighbors, finding out that they were living next door to The Amazing Dog Training Man, decided to fast track their plans to get a puppy and brought the little guy home over the weekend. Smart move, I’d do the same thing if I lived next door to me. Anyway, they have a great advantage, not because they live next to me,but because the puppy has not yet developed behaviors that we humans deem unacceptable and in most cases – bad! And I am going to meet with them tomorrow night and I will share many puppy training tips with them but I will share one nugget that I consider some of the BEST advice I could share with any new (or seasoned) dog owner. AND, AND, AND, because you are a such a loyal and faithful reader who tunes in everyday to get insightful, educational and highly entertaining blog posts, I am going to share it with you too. FOCUS, PAY ATTENTION AND REWARD BEHAVIORS YOU LIKE, ignore, manage and in some cases apply a negative consequence to behaviors you want to stop. Believe it or not but that is dog training in a nutshell. The problem that I see day after day is that people tend to focus all of their attention on behaviors they don’t like. By giving attention to these behaviors they are actually making them worse. One of the biggest problems for puppy owners is biting and mouthy behavior. The person get frustrated and and FOCUSES on the biting. They slap, scruff shake, pinch, alpha roll over, and scream at the pup and then…..
Then when the pup lies down at their feet, when the pup is calmly chewing on a toy, she is ignored. 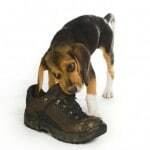 All the attention of the owner happens when the pup bites, or steals socks or barks at them. Please, don’t get me wrong. I am not one of those trainers that says ignore the pup when they jump, bite, bark or steal. I do apply and teach negative consequences for certain behaviors. This does NOT me that I hurt or harm the dog, I just apply a consequence that helps them get the picture a little faster than standing there waiting for the right behavior to make an appearance. hi. I have an intact 2 yr old border collie. lately he has started growling and snarling and me and hubby. normally he is a very well behaved dog. I have another dog & 2 cats and they all get along just fine. Should I ignore the growling? No. Never ignore growling. Growling is a warning and needs to be dealt with. I would recommend contacting a trainer in your area for help with this. Be careful choosing a trainer. Many do not know how to deal with aggressive behavior. Good luck!